In a lot of ways, Ukarumpa is a great place for kids to grow up. Great schools and all your friends live within walking distance. No TV, and so kids spend a lot of time running around outside. But for teenagers, it can be kind of hard sometimes. They can learn to drive, but there is no where to go! They can’t leave the center without an adult. There really isn’t much to do. 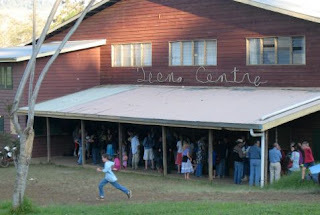 So the Teen Center was built – a place where teens can go and do activities and hang out. And on Friday nights when school is in session, the whole community gathers around for Hamburger Night. (As you can see in the photo, people start lining up a half hour before the window opens!) Since many of the teens in Ukarumpa won’t go back to their home countries until they are ready for college, someone decided it would be good for them to be able to get a little bit of work experience while in High School. On Friday nights the kids cook up hamburgers, hot dogs and fries. They get to earn a little money and get some experience in a fast food type of environment. And it’s a great way for people in the community to “eat out” – that is, to eat a meal that they didn’t make from scratch. Brian and I volunteer to be adult helpers at Hamburger Night once a school term. That means that about four times a year we come and work alongside the teens (Brian at the grill flipping burgers and me filling orders). In exchange, we get a free meal.